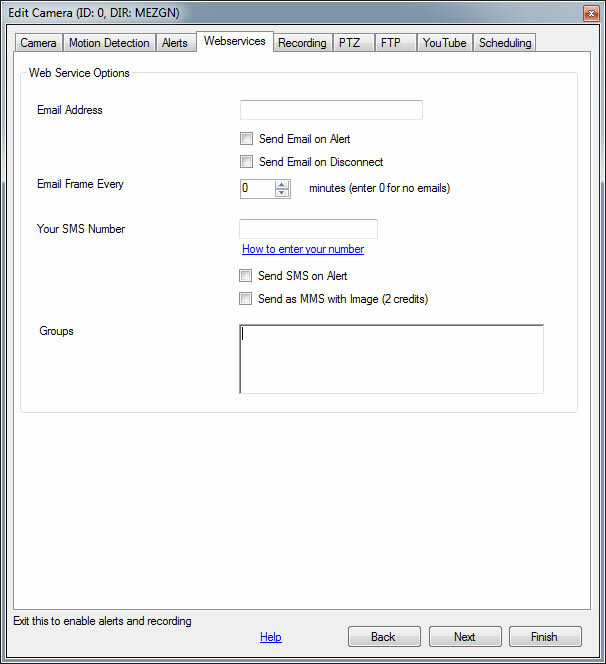 iSpy can email you alerts with a framegrab as an attachment. iSpy can also email you a framegrab on an interval (say every 20 minutes). Note that iSpy will send a maximum of 30 emails in a half hour period per user. Enter your mobile phone number here to receive an SMS alert. The number must start with your country code, followed by your number excluding the leading zero. For example if you live in Australia and your mobile number is 0416 123456 then you'd enter 61416123456. If you are away from home and you are getting too many SMS alerts you can turn them off for specific cameras through iSpyConnect. This textbox is used to administrate access to people that you grant access to through ispyconnect.com. For example, you might enter here: "Family, Office" to allow people to view this camera with "Family" or "Office" specified in their Access mask on the access control page. Leave this blank to allow access to everyone (that you explicitly grant access to!). This control is useful if you want to restrict access to specific cameras.